An original and unique concept! In Pop Cereal you can find almost all the cereal you can find in the supermarket and in fact a few more because some of them only exist in other countries. The decor is very cute and original and we roll back to the pop art and colors, having at the same time an environment that makes you feel at home. In fact, there is a bunk bed where we can sit and eat our favorite cereal and some people sleep their “siesta”. 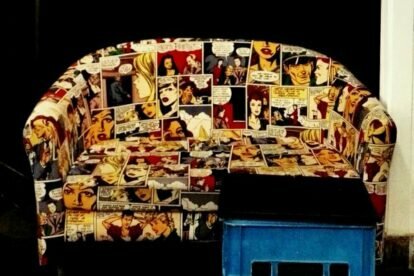 One of my highlights: the originality of the couch (that is at the entrance) covered with pop art and the detail of having a table, chair and a bowl of cereal hanging from the ceiling. If you like cereal, you will have problems choosing what to eat from the menu. However, all the employees are very nice and ready to clarify all the doubts you may have about anything the menu has. Just like the decor, the service makes you feel at home and you will want to return. Of course that they also have coffee and milkshakes. Go for it, cereal killers! !